Cut pumpkin in half lengthwise; remove seeds. Bake in 350 degree oven for about an hour. Set aside to cool. Scrape flesh from the shells of the cooled pumpkin and puree in a food processor until smooth. Add salt, cinnamon, allspice, cloves, eggs, yogurt, and honey to pumpkin puree and mix thoroughly. Pour pumpkin mixture into two unbaked pie crusts. 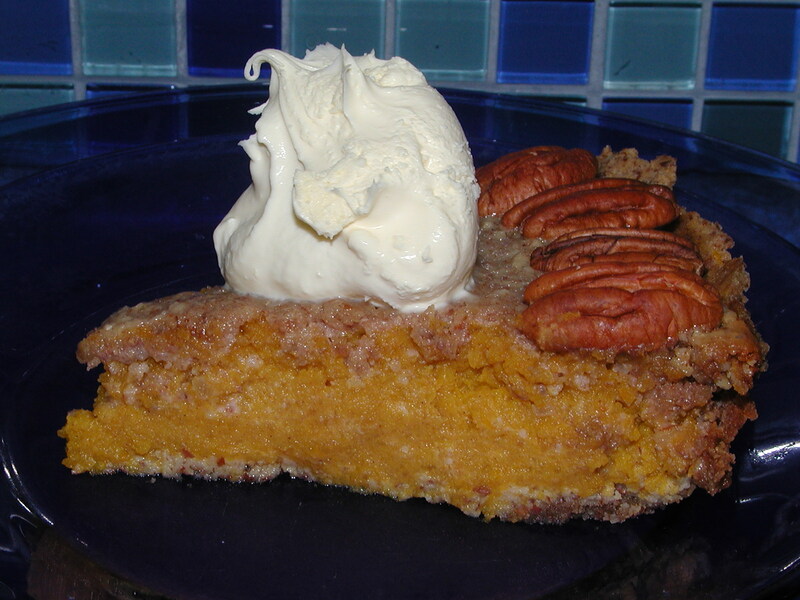 Mix all ingredients for pecan pie layer and spread evenly over the pumpkin pie layer in both pies. Decorate with pecan halves around edge of crusts. Bake at 350 degrees for about 35 minutes. Makes two pies. Enjoy!